حافظ خیابانی, ندا, فتحی, سهراب, شکری, بابک. (1394). بررسی تأثیر پلاسمای تخلیه سد دی‌الکتریک بر روی احیای کاتالیست فرایند ریفورمینگ نفتا. فصلنامه علمی ترویجی فرآیند نو, 10(52), 113-125. ندا حافظ خیابانی; سهراب فتحی; بابک شکری. "بررسی تأثیر پلاسمای تخلیه سد دی‌الکتریک بر روی احیای کاتالیست فرایند ریفورمینگ نفتا". 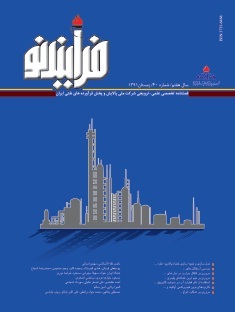 فصلنامه علمی ترویجی فرآیند نو, 10, 52, 1394, 113-125. حافظ خیابانی, ندا, فتحی, سهراب, شکری, بابک. (1394). 'بررسی تأثیر پلاسمای تخلیه سد دی‌الکتریک بر روی احیای کاتالیست فرایند ریفورمینگ نفتا', فصلنامه علمی ترویجی فرآیند نو, 10(52), pp. 113-125. حافظ خیابانی, ندا, فتحی, سهراب, شکری, بابک. بررسی تأثیر پلاسمای تخلیه سد دی‌الکتریک بر روی احیای کاتالیست فرایند ریفورمینگ نفتا. فصلنامه علمی ترویجی فرآیند نو, 1394; 10(52): 113-125. In this study the effect of DBD plasma on regeneration of Pt-Sn/Al2O3 catalyst was investigated. Application of plasma in the catalyst regeneration causes the regeneration process in the lower temperature and pressure that may increase the stability and useful life of the catalyst. Temperature programmed oxidation analysis was used to confirm removing the coke from the catalyst after regeneration. BET analysis was used to study the surface area and pore volume of the catalysts. Metal surface area, metal dispersion ratio and average crystal size were determined by CO adsorption. Finally the catalyst performance test revealed that the paraffin content of the feed was decreased from 39.3 to 21.09 and 24.33 V% over the fresh and DBD plasma regenerated catalysts, respectively. Also, the aromatic content was increased from 12.4 in the feed to 67.31 and 71.96 V% in the product over the fresh and regenerated catalysts, respectively.